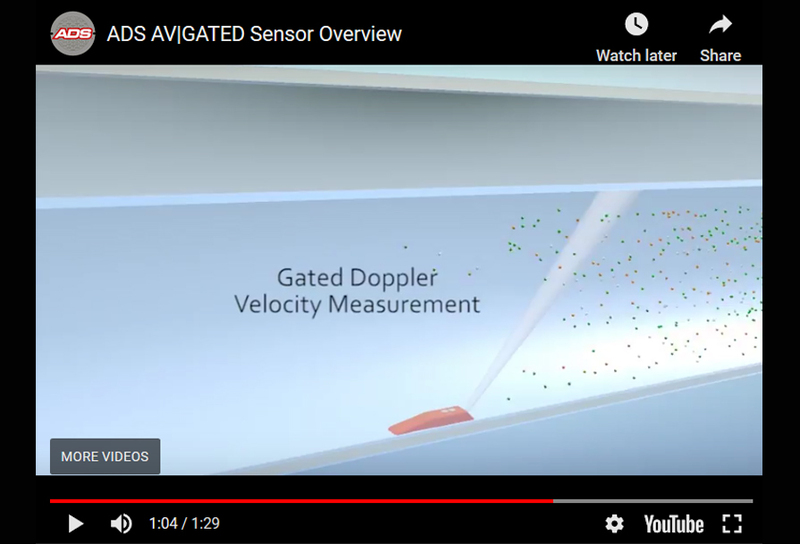 Gated Doppler Velocity: Gated velocity technology works by measuring flow velocity at multiple discrete points, allowing the sensor to better characterize the velocity distribution and best measure average velocity. The returning reflected signal is processed using a digital signal processor, from which average velocity is calculated. Ultrasonic Depth: Ultrasonic depth technology operates by measuring the elapsed time for an ultrasonic signal to travel to the flow surface and back, and calculates the distance to the flow surface. This information, in conjunction with data pertaining to pipe geometry, is used to compute wetted area area of flow. Ultrasonic depth optimizes measurements up to full pipe, while pressure depth provides redundancy and allows measurements during surcharge conditions. Pressure Depth: Pressure depth technology measures the depth of flow by recording the difference in atmospheric and water height pressure. The pressure depth technology of the AV|GATED sensor serves as a back up the ultrasonic depth sensor. In addition, the pressure depth records the depth of surcharge.